As most of you already are aware, the replacing of the bridge on Dandy Trail over Eagle Creek will be starting soon, with the project finishing up toward the end of the year. Those of us who travel that way regularly know how this is long overdue; the current layer of blacktop was just a temporary fix to get us through the winter. Many of you either attended the meeting last fall or heard from those who did attend about this project. 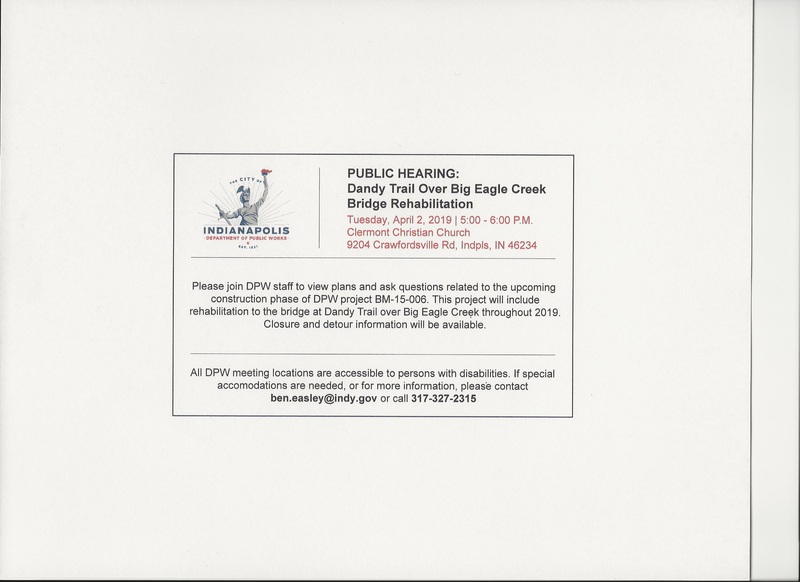 I have had a lot of inquiries about the “Dandy Trail Over Big Eagle Creek Bridge Rehabilitation”, but I have not been able to get a lot of information. I was informed Friday about another meeting that will be taking place on Tuesday, April 2nd, from 5:00 p.m. – 6:00 p.m. at the Clermont Christian Church, located at 9204 Crawfordsville Road. Here is a way for you to get more information, ask questions, and view the plans for this project. For those of you who attended before, I have been told that they definitely have a larger room this time. While this affects the neighborhoods and residents who live in the area off of Dandy Trail the most, it will have an impact throughout much of our district as well. The limited north/south streets, as well as the limited east/west streets due to the reservoir, will make many of your trips longer and will also change the amount of traffic in certain areas, especially High School Road from the 38th Street area to Crawfordsville Road, which to my understanding will be the marked detour. There are also many commuters and others who use this corridor every day who will be finding new ways to get to work, school, church, shopping, etc. with traffic on many streets being affected. I would encourage you to attend this meeting to learn more, especially if you live in the immediate area or travel that way frequently. I have attached the information that I have received. Please feel free to share this information with others, not only in your neighborhoods and our district, but with those that you know will be affected by this closure. P.S. I would like to encourage everyone to be reporting pot holes that you encounter in our area. While I have been driving the district and reporting a list of pot holes on a regular basis, I do not see all of them. Currently, DPW is still filling the ones on thoroughfares and major roads, but once these are filled they will start in neighborhoods. Also, it seems new ones appear daily! Please help get all of these problem areas reported by either calling the MAC at 317-327-4622 or using the app on your phone. By working together we can make sure the city is aware of the needs in our District. Thanks for your help!